In fulfilling their storage and buffer functions, air receivers play a key role within a compressed air station: they provide capacity during periods of peak demand and are often used to separate condensate from the compressed air. It is therefore important for receivers to be correctly sized for the specific system and to be resistant against corrosion; inspection intervals should also be as long as possible. Needless to say, air receivers from KAESER KOMPRESSOREN meet all of these requirements and more. 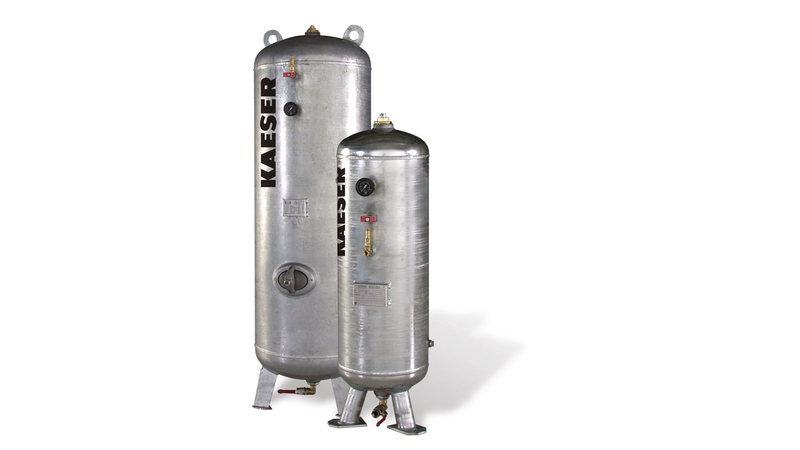 Whether 90 or 10,000 litres, 11, 16, 45 or 50 bar, all KAESER compressed air receivers are designed and manufactured to the highest quality standards to ensure exceptional safety and durability. You only get genuine KAESER quality with genuine KAESER air receivers. Moreover, they are exceptionally corrosion resistant and guarantee perfect sealing. This is due to a combination of the precision thread finishing process that takes place following galvanisation, and the extensive protection measures that are taken during transportation. Meticulous design, including thicker walls in accordance with AD 2000 regulations, enables long inspection cycles of up to five years. This not only reduces service and maintenance costs, but also increases compressed air efficiency and availability.